The $615 million Convention Center project gets all the glory, but there is “a little jewel” that project manager Maria Hernandez loves to talk about: the Carl Fisher Clubhouse which is about to undergo a $2.5 million restoration. The original building was designed by architect August (Gus) Geiger and was constructed in 1916 as the Miami Beach Municipal Golf Course Clubhouse. Geiger worked with Carl Fisher on various projects including Fisher’s residence in 1925. 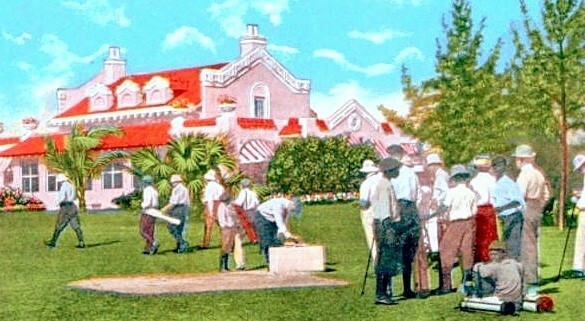 The Golf Course was purchased by the City of Miami Beach in 1939 and, today, the Clubhouse is the oldest public structure in the City. It was designated as a historic site/landmark in 1983. The Annex or “Little Theater” building was added in 1937. Designed by Robert Taylor, architect for Española Way and The Bath Club, the Annex was part of theater and band shell additions. The Clubhouse was “semi-abandoned” according to Hernandez and has everything from termite to water damage. In addition to repairs, it needs to be modernized. The restored Clubhouse and Annex will be a multi-purpose facility for receptions and special events. It will include a small catering kitchen and ADA accessible bathrooms. While almost 5,000 square feet, she described the Clubhouse "almost like a pavilion in a way. Everything around it is just large.” Though part of the Convention Center campus, it is designed to be independent with its own kitchen. “It will be able to host and feed its own events,” she said. 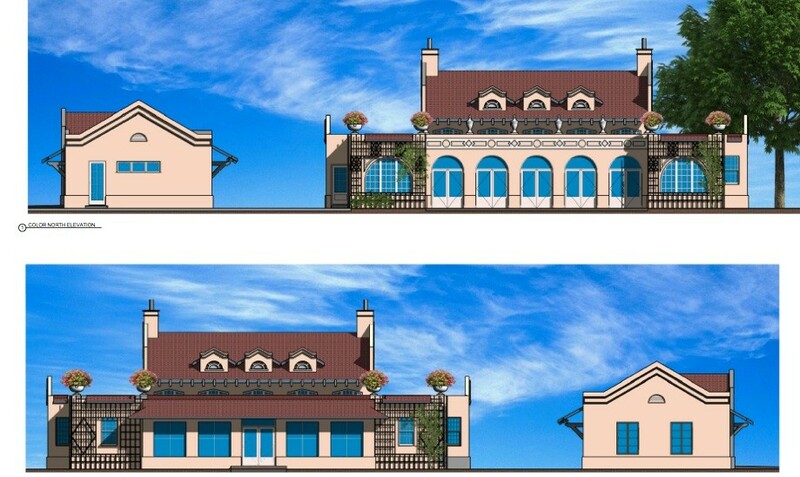 Renderings of restored clubhouse and annex. Courtesy RJ Heisenbottle. Originally, there was thought given to elevating the Clubhouse to make it resilient to sea level rise but Hernandez said that proved problematic for the site plans. “For us to spend $1 million raising the building, you really have to try to get a lot of bang for your buck. But there is a limitation to how much you can raise it without truly compromising everything we’ve designed," she said. "There’s a lot going on in that little park back there. We’re keeping all of the trees… including that giant strangler fig. We designed the building around it. It’s a big focal point back there.” With a narrow space between the canal and the building, any elevation causes the building to be “very tall in a very small space” creating deep pits around trees and compromising the natural vegetation. Plans call for an open green space and a bicycle and pedestrian pathway along the edge of the canal to Convention Center Drive with sculptures and sitting areas. “If we raised the Carl Fisher too high, all of that would be blocked,” she said. “The whole design has to be looked at holistically.” She added, “To spend that kind of money to only be able to raise the building 3-4 inches, it’s not worth it. On top of that it’s risky, we could hurt the building more, damage it more. It’s not worth it.” So the focus moved to restoration. Hernandez said a “new massive stormwater pump station” has been installed next to the Clubhouse which will protect the area. The project goes to Commission for approval of a guaranteed maximum price in July. Construction is expected to begin in September and finish at the same time as the Convention Center project in the Fall of 2018.